You know how you would love nothing better than to share some good news with your friends, right? Well, obviously watching a movie together works out great, but what happens when it comes to your favorite tune by someone whom you deem to be the best musician alive, ever? Sure, a good speaker would often do that tune justice, but you cannot be carrying a speaker around wherever you go, can you? This is where a good pair of headphones come in handy, but sharing half an earpiece is not the best idea around. 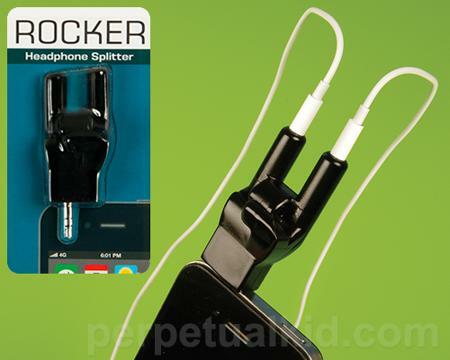 I guess the $11.49 Rocker Headphone Splitter would be a whole lot better, as you get to wear your own pair of headphones without losing out on mobility and audio quality. This is also the ideal audio accessory to use whenever your and your best mate are not rocking out to the latest band, but are playing a game or watching a movie on your tablet or smartphone. Couples would clearly learn to appreciate it, as it works great whenever you want to listen to some shared tunes while you are on a long road trip, on a long haul flight, out camping under the stars, or just cozying up with one another on the couch. Got to love the design, too, and the Rocker Headphone Splitter works with any standard 3.5 audio jack.